One side was OK it took about half the tube of grease but the other side was full of axle oil. So l take it the seal between the axle and swivel has failed. But do l need to do anything about it? I checked the axle and the oil level was fine although it clearly has been contaminated with swivel grease. So l changed the axle oil anyway. The swivels themselves are OK, they were replaced about 18 months ago by a LR garage. The swivel that’s full of axle oil is leaking a little (l think that’s why they changed to grease?) but not enough to be an issue. So long as it has oil or grease in there, It's not an issue. But it's ok to leave it as is for now, just get set for a messy tedious job at some point. Well, as the swivels were replaced last year l am going to let the garage who did the work have a look at it. As it’s only done around 10,000 miles since. Not sure the garage will give you any joy, as the seal in the stub axle has failed and is not disturbed when doing the swivel joints?..... May be bad timing but they are a wear and tear item, that said some guys DO knock the stub axle seals out and let the diff oil (EP90) flow straight through. Garage may renew swivel seal at best if deemed to have failed significantly??? If it wasn’t leaking out of the swivel seal l would leave it, but it’s leaking oil onto the inside of the tyre. l am happy to pay them for the work if it’s nothing to do with replacing the swivels. After all, the Landy is 14 years old and has done over 100,000 miles so l would expect some issues to crop up from time to time. That's the hub seal leaking, isn't it? 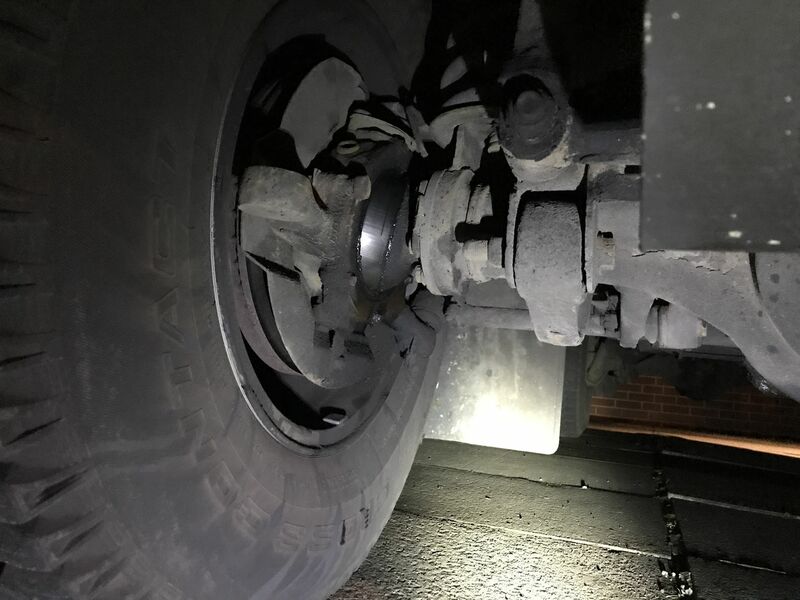 Looks like it, as the swivel is full of axle oil and the axle oil is contaminated with swivel grease. That wouldn't bother me, lubrication is good. Especially of flange splines. But lube can only escape to the outside tyre at the swivel seal, or the hub seal between the stub axle and the bearings. If the swivel seal is good, then it must be the hub seal. Simple job, really. If running oil through then the double lipped earlier hub oil seal is perhaps a sensible fitment. Well the swivels and seals are fairly new. Yes, no, that's the swivel seal. That shouldn't leak, irrespective of the lube. Series swivels run on oil, and, if done properly, don't leak like that. So is it worth paying to get the suspension dismantled to repair this fault? Or will it be fine to just forget about it. I’m guessing there’s going to be a bill for over £200 if l get it done. Somebody has said that some people don’t even fit the seals and let the axle oil lubricate the swivels! It's not the whole suspension really, wheel off, caliper off, swivel to axle tube bolts out, pull off entire hub/swivel assembly. Replace seal and put back. Still likely to be 200 with today's labour prices. OK well probably best to get it done then. It is do able if you are a competent DIY mechanic, if the cost is an issue. No after the horror that was replacing the rear discs, l’m going to let the garage do it. Well, it’s gone in today for new oil seals and a new nose seal on the front diff as that’s leaking too. l replaced the rear one myself some time ago, but they may as well do it while it’s on the ramps.